Dark-field microscopy is ideally used to illuminate unstained samples causing them to appear brightly lit against a dark background. This type of microscope contains a special condenser that scatters light and causes it to reflect off the specimen at an angle. Rather than illuminating the sample with a filled cone of light, the condenser is designed to form a hollow cone of light. The light at the apex of the cone is focused at the plane of the specimen; as this light moves past the specimen plane it spreads again into a hollow cone. The objective lens sits in the dark hollow of this cone; although the light travels around and past the objective lens, no rays enter it. Visualization of live bacteria: Spirochetes bacteria observed under dark field microscopy. The entire field appears dark when there is no sample on the microscope stage; thus the name dark-field microscopy. When a sample is on the stage, the light at the apex of the cone strikes it. The rays scattered by the sample and captured in the objective lens thus make the image. Samples observed under dark-field microscopy should be carefully prepared since dust and other particles also scatter the light and are easily detected. Glass slides need to be thoroughly cleaned of extraneous dust and dirt. It may be necessary to filter sample media (agar, water, saline) to exclude confusing contaminants. Sample materials need to be spread thinly; too much material on the slide creates many overlapping layers and edges, making it difficult to interpret structures. 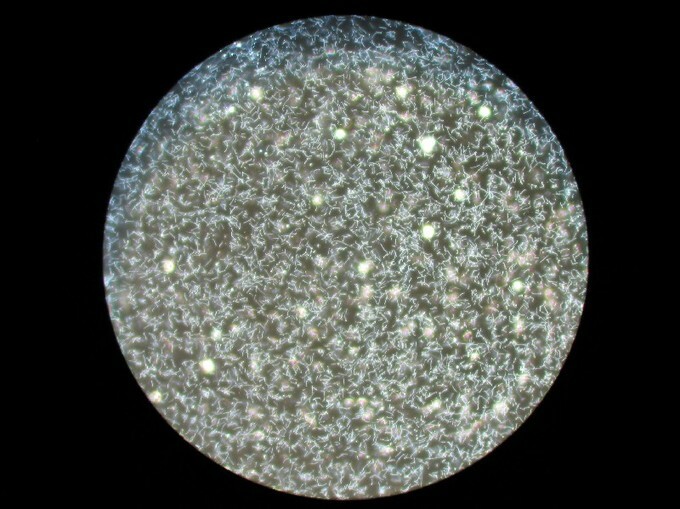 Dark-field microscopy has many applications in microbiology. It allows the visualization of live bacteria, and distinguishes some structure (rods, curved rods, spirals, or cocci) and movement. In dark-field microscopy, the light reaches the specimen from an angle with the help of an opaque disk. The specimen appears lit up agains a dark background. Dark-field microscopy is most useful for extremely small living organisms that are invisible in the light microscope. condenser: A lens (or combination of lenses) designed to gather light and focus it onto a specimen or part of a mechanism.